According to Verité’s monitoring of parliamentary activity, the JVP, with only seven MPs in a house of 225, has five among the top ten performers. Parliamentary party leader Anura Kumara Dissanayake is No. 1 and Sunil Handunneththi No. 2. It is no accident that many of these MPs were trained in the hard sciences at the university and bring their acumen and work habits to parliament. The celebrations were to a full house at the Methodist Mission’s Trimmer Hall by Central College at 2:00 PM today, July 23. Posters and poetry in Sinhalese and Tamil addressing peace and reconciliation were on display outside the hall in the compound. To underscore the attention they are giving to Tamil issues, Mr. Chandrasekaram pointed to Mr. Bimal Ratnayake, MP, who had read engineering at Moratuwa for some years, and is now spending a great deal of time in Jaffna. The JVP in keeping its focus on brotherhood and harmony, gave due attention to the problems at University of Jaffna. In addition to pressuring parliament to not forget about the grave state of matters at the university, the Socialist Youth Union had arranged special speakers to address this. Of particular note were Ravindu Salinda, the Vice President of the students’ union at the new Faculty of Engineering Jaffna in Kilinochchi, and perhaps even more important, G. Neraf, the former President of the Arts Faculty Students’ Union who is still a student. Both emphasized the importance of harmonious relations and expressed to applause their readiness to do anything towards achieving such relations. The high point of the evening was the energetic final speech by Anura Kumara Dissanayake. It was effectively translated by Wimal Swaminathan to repeated applause as Dissanayake called for good relations between the communities and said that the problems are created not by the Sinhalese but the families forming 10% of the country who have been ruling us. There was very loud and long applause at the end of his speech, setting the atmosphere for the merriment to follow tea and enjoyable cultural performances by children from many schools (Central, St. Patricks, Hindu and others from far away). Prizes were distributed. The Janatha Vimukthi Peramuna (JVP), which had staged two insurrections, one in 1971 and the other in 1989, and was banned twice, in 1971 and 1983, is today the most active parliamentary party in Sri Lanka, scoring high in an assessment conducted by Verite Research. According to Verite Research’s www.manthri.lk which keeps track of the performance of Members of Parliament (MPs) in a scientific way, JVP is the top scorer in the present (8 th) parliament, which was elected in July 2015. The JVP has only seven MPs in a house of 225, but five of them are among the top 10 ten performers. 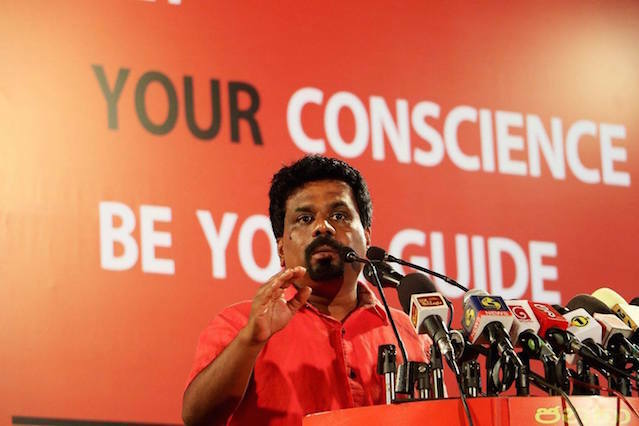 JVP’s parliamentary party leader Anura Kumara Dissanayake (Colombo District MP) is number one in the long list of 20, followed by party colleague Sunil Handunneththi (National or nominated List). I am glad to hear this. This is not a surprise. North has given plenty of opportunities to TNA purely on the basis of race. But what have they achieved? Nothing. So they would naturally be looking for alternatives. I think these 5 JVP MP’s should be awarded the “Top five Jokers” award simply because the country hasn’t got anything out of their performance other than a load of jokes. They are in politics now close to half a century, and they could not get more than 5% of the total votes. That speaks of their “Performance” eh? Not surprised at all the love these guy get in Jaffna which will add up to naught at an election. What is interesting is the fact that this writer does not know that JVP got 32 seats in an election. Last election JVP were gunning to be the second force. Well they barely secured five seats. At the current rate if whether they will be even in a position to retain that five in the next election is the question. If this so called researcher has gone down south with his questionnaire he would have got some interesting findings. They showed their true colours in style with the stupid carrot and stick dance they did with their national list last year – nominating professionals to the list, then appointing defeated candidates through the back door, who have to date done absolutely nothing to justify their presence in parliament. Let them enjoy another dream. No matter the percentage of votes JVP nobtained. I appreciate their hardwork for the ethnic reconviliation of SL. 1. I am so so glad that Weerawnasa ad Somawansa are no longer with them. This covers the level of education, brains and the affinity towards peace. 2. JVP student union did a stellar job when UNP student union tried to attack the Tamil students in 1983 in Peradeniya. You have to walk over our bodies to touch the Tamil brothers, they stated and stood guard around the Akbar-Nell-New Hall complex. JVP is talking to Tamil youths which is unique because the other political parties do not. JVP must listen to the grievances of the NP & EP youths like the very high unemployment (twice the national average) and convey these to their counterparts in South. It is time the JVP takes a realistic stand on the issue of devolution of powers to the periphery from the provinces downwards. Greater devolution means greater democracy. This issue should never be mixed up with ethnic issues. Furthermore devolution should not be necessarily interpreted as federalism or separatism. Only when the JVP becomes more enlightened on this matter of devolution it can hope to win the support of a substantial segment of the minorities! I also hope that the JVP has fully cleared its confusion of the presence of of a considerable number of plantation workers of Indian origin in the hill country as anything to do with Indian expansionism. Those hapless workers whatever their origin are some of the worst exploited workers anywhere in the world and have hardly any link with the Indian Big bourgeoisie! The JVP apart from expressing pious platitudinous rethoric on propaganda platforms has not yet been forthright in declaring it’s position with respect to the inalienable rights the Tamil minority community have as equal citizens in SL. It has not for instance done anything tangible so far to at least see to the problem of Tamils being sent official communications in the Official Language or even to see that a marriage or death certificate issued in Tamil to Tamil persons who happens to reside outside the NE of the country. Will Comrade AKD agree that facilities for recording statements in Tamil by a complainant at a police station outside the NE exist or not? What has he done about that if it does not exist? ” inalienable rights the Tamil minority community have as equal citizens in Sri Lanka”. This is a basic question/ problem. Solution: Use a 25 lbs hammer on the nut of the safron robed, the moment they come out.The problems of the Tamils is not language, religion or economics but the safron robed brigade.They are the blood suckers.